I know what you’re thinking. Tofu?! Ugh! This simple Korean dish is one of my favorite ways to eat tofu. 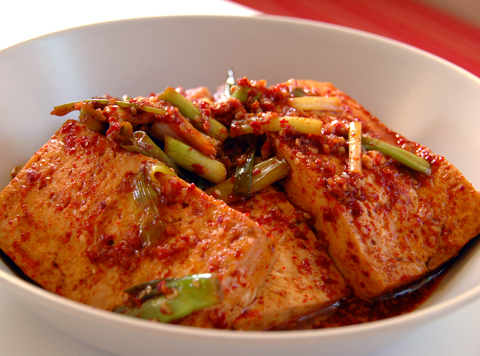 The tofu is first lightly fried then simmered in a soy sauce spiked with garlic, green onions, sesame and Korean chili flakes. It absorbs the sauce beautifully and has a texture a little like steamed eggs. Totally easy and tasty. One important thing to note is the use of Korean chili flakes (gochugaru), which are different from the chili flakes we like on our pizza or in pasta dishes. The Korean version doesn't really have seeds so it doesn't pack the same heat. However there are spicy versions, which would be indicated on the packaging. I don't think the two taste a like, so substituting the regular red pepper flakes will not give the same result to the dish. I think it's worth it to take a trip to your local Korean or Japanese grocery to pick up a bag. 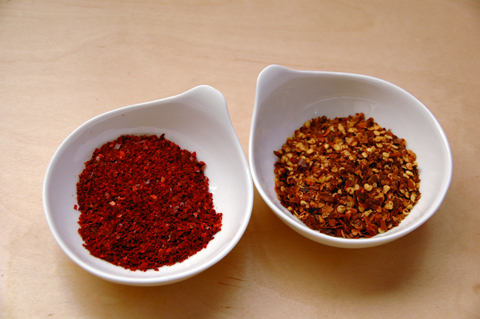 Korean red pepper flakes (left) vs. regular red chili flakes. Lay the sliced tofu out on paper towels and lightly sprinkle with salt. Allow to sit for about 10 minutes. This will draw out some of the excess water. Blot the slices with a paper towel before frying. Make the sauce by combining the soy, chili flakes, sesame oil, garlic and sugar in a small bowl. In a hot frying pan (something that is non-stick; I used well seasoned cast iron), fry the tofu slices in about 2 tbs oil for about 3 minutes on each side. The goal is not to get a crispy crust, just cook the tofu so it’s not raw. Add the scallions and fry for another minute. Add the sauce and bring to a boil, then reduce the heat to low. Simmer until most of the liquid evaporates, flipping the tofu slices at least once during the process. We like it a bit saucy, so I don’t let the liquid evaporate all the way down. Throw in the sesame seeds and remove the tofu to a serving platter. Ladle the sauce over. Serve warm or at room temp. This makes a wonderful side dish in a multicourse meal, but it’s just as filling when eaten alone with steamed short-grain rice and a few fresh cucumber slices (or tomato slices) or Korean pickles. This is my submission to Regional Recipes, where the spotlight is on Korean food. The host this round is Wandering Chopsticks. If you’d like to participate, send your submission to wanderingchopsticks(at)gmail(dot)com by midnight, June 15th. i make something like this but i just serve the silken style tofu cold, with the sauce on top. i've been served it a lot at korean restaurants, and now it's a favorite to make at home. Justin, my preference is cold silken tofu as well, but my son and husband won't touch it :-( Hubby is probably a lost cause but I'm not giving up hope the kid yet. I LOVE tofu. All kinds of tofu and am always looking for new recipes for it. This sounds lovely, and as my good buddy has recently switched to a vegan diet, this works wonderfully to serve her! YUM! yeah, a lot of people only like tofu fried. i guess it's an acquired taste. There's this korean taco truck craze going on now in SoCal, and a korean spicy tofu taco is one of the offerings. I've stayed away from the tofu taco in favor of the pork and beef versions, but next time that truck rolls by I'm all in for the spicy tofu! Paula, isn't it hilarious? vegitalian! Marvin, I was just talking to Wandering Chopsticks about the Korean taco truck craze. It has hit PDX too, and tomorrow we're going to hunt it down. However, tofu doesn't stand a chance--I'll be going for the beef and pork. So excited! Yeah, those of us with kids hear ya. Sometimes it's just easier to whip up a little Korean Spiced Tofu, right? Tofu is one of those things that I've tried to like, but I just don't. Though, this does look like it definitely has possiblities! Pam, I won't hold it against you :-) It took a lot of tries for me to get hubby to *like* it. He's picky. He'll eat this but some other stuff he won't touch. LC, don't give up on the kids! They still have many years to learn to like it, at least that's what I keep telling myself. I love tofu. Always have. I think the only times when I'm disappointed by tofu is when people use it as replacement for something else (tofu vegan cheesecake, etc.). IMHO, tofu exists primarily as a food and is to be appreciated as a food in its own right, not merely a meat/dairy replacement for "vegitalian" cuisine. This looks very good, Darlene. Give me a bowl of rice topped with this tofu and I will be a very happy girl. In fact I'm thinking more like, "Tofu... AWESOME!" Being Korean, I grew up with tofu as a staple. I cannot survive without it! Thank you for featuring Korean recipes. It's pathetic - even though I grew up eating Korean food, I never quite learned how to cook it. The spices here remind me of kimchi and my kid loves that stuff. I think deep-fried Korean spiced tofu is great! Christina, I can relate...I didn't cook anything until I was out of my mom's house and cooking the food I grew up on has been a real learning process. I wish I paid more attention when I helped mom in the kitchen. momgateway, yes, the pepper flakes are used in kimchi as well. Unfortunately, my kid won't touch kimchi, even though he will eat this. I'm not giving up hope though. I agree with you and Leela that tofu should be appreciated for its own merits, not as a replacement for something else. Your dish looks delicious! I love tofu and I love kimchi. But it hasn't came to my mind that I can eat both together! Thanks for the idea and recipe, will definitely try this out myself. I am dying of laughter from that pic! I will be the first to admit that I am not a huge tofu fan. I like it in soups and miso but I just think I have never had a knock your socks off tofu dish. Although for some strange reason even though I do not like it I still manage to have a block of it sitting in my fridge. Also, thanks for the newer ingredient and my next trip to the store I will have to score some. Anyhow, don't let that tofu in your fridge go to waste! Im lucky that my husband and i love tofu, we'll make this soon! The photo was funny, i bet they got a lot of customers with that! :) I'd love to guide our readers to your site if you won't mind. Just add this foodista widget to this post and it's all set to go, Thanks! this looks delicious! a great contrast would be to serve it along side japenese hiyakko style tofu. So glad to have discovered your site! My parents claim tofu isn't real food, but I adore it! I can't really understand where they're coming from. This looks great, I love the way tofu soaks up sauce. Joanne, that's funny. I know some friends that may say the same thing. They just don't know what they're missing. My wife bought this at the Korean store and both of us love it. Thank you for posting this. Definitely will try it tonight.